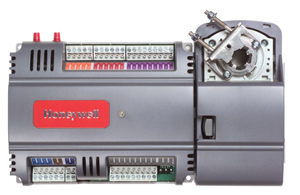 October 2014 - Honeywell Spyder VAV and unitary controllers are available with either a LON or BACnet interface. These controllers typically have 21 physical points but this point count can be expanded on the BACnet versions by adding BACnet Cube I/O modules instead of adding another Spyder. Cube I/O modules are low-cost, low-density DIN-rail modules with a variety of I/O point configurations. Installation can be accomplished using a Honeywell WEBstation-AX (Niagara workstation) with an installed Honeywell Spyder Tool for configuration and commissioning. Connecting the WEBstation to the Spyder is facilitated with a Contemporary Controls' BACnet MS/TP to BACnet/IP router. The Cube I/O series is available as either BACnet MS/TP or Modbus RTU devices. They all are DIN-rail mountable and can be powered from 24 VAC/VDC power source. They can share power with the Spyder controllers. They are available in several I/O configurations including a model that supports four binary inputs and two binary outputs. The BMT-DIO4/2 is the module used in the application note that we authored giving step-by-step instructions on how to install a typical Cube I/O device to expand point count in a Honeywell Spyder. Read the Application Note PDF to learn more.